Tip #1: Use your finger as a pacer, to eliminate fixations and regressions. Tip #2: Use visualization techniques to memorize facts such as names, numbers, and dates. Tip #3: Expand your vocabulary, so you don't stumble on unknown words. Practice these tips until they are habits, and you will soon be zooming through books, essays, articles, and any other reading material. Whether reading for school, work, or recreation, you'll read faster and retain more. Increasing your average reading speed can make you a more effective learner. As Peter Kump, author of the speed-reading course Breakthrough Rapid Reading, says, "...mind organization starts with the ability to absorb printed material rapidly." I've been working through his course book (shown at left), and it's been a real eye opener. My average reading speed, which I measure with a timer, has nearly doubled. 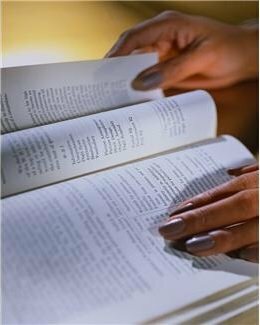 Speed reading techniques help eliminate behaviors that tend to lower your average reading speed. Instead, you learn reading habits that take advantage of your brain's potential. Use your finger as a reading "pacer". Kump didn't invent the finger pacer. Many classic speed reading courses, including Evelyn Wood's famous course, recommend the same thing. You may find this curious at first, as I did. Don't children point at words when they read? Why go back to that? Eye fixations are unintentional visual pauses during reading. These fixations decrease your reading rate significantly. As you read that paragraph, your eyes did not glide smoothly through the text. They jumped from word to word, or at best from phrase to phrase. Which runner will win the race: the one who runs continuously from start to finish, or the one who stops every ten feet? Stopping slows you down. Eye fixations are stops. They hold you back from achieving a higher average reading speed. While reading a book, you can have literally thousands of fixations. They add up! Regressions also slow you down. The next time you read, notice how often you are forced to re-read sentences or sections. Going back to re-read is a regression. Regressions occur because you did not absorb the information the first time. Regressions should be unnecesary. They waste time, decreasing your overall average reading speed. Reading with your finger as a pacer eliminates fixations. (Try it, you'll see). It also helps to decrease regressions. That's because your comprehension tends to go up as you get through more material in a shorter amount of time. Sweep your pacer under the words as you read. Your finger is a built-in speed-reading tool. Use it! You'll likely double your average reading speed or better. If you're too embarrassed to use your finger or hand, sweep under the words with a pen or pencil. Anyone watching will think you're planning to underline or make notes on the page. Increasing your average reading speed obviously shouldn't come at the expense of understanding what you read. The goal is to read faster while at the same time comprehend the material at least as well, if not better, than before. When you read too slowly, your mind gets bogged down by the words on the page. Try this: Read the following paragraph at a snail's pace, super slow, with lots of pauses, and you'll see what I mean. Did you notice how difficult it was to hold in mind what you had already read? We don't talk to each other in slow motion for the same reason. What you will find, with practice, is that boosting your average reading speed actually increases your reading comprehension. When you read at a faster pace, the ideas expressed in the writing come through louder and clearer. My impression as I speed read (using my finger or pen as a pacer) is that my mind is focusing more on absorbing the meaning of the passage and less on simple mechanical parsing of sentence structure. Increasing your average reading speed also stitches the material closer in time. When you read slowly, you tend to forget connections from previous paragraphs or pages - because they were read too long ago. This delay makes it harder to connect what you're reading at the moment with material presented earlier. The best way to remember a novel is to read it straight through. The worst way is to read a page a day, or allow days or weeks to elapse as you read through little parts at a time. You must get the material into your mind within a reasonably period for it to hang together. Yes, it is possible to read too fast. There is a point of diminishing returns. But once I started using speed-reading techniques, I was surprised and pleased to discover that speeding things up to a certain degree helps me remember the content better. And it should work for you. Remember, the elimination of fixations and regressions by using a reading pacer is instrumental in achieving this effect. Comprehending what the author is saying is one thing. Remembering specific facts is quite another. Increasing your average reading speed brings a certain clarity to the material. That, in itself, helps you remember it better. But you still may struggle to recall factual items. The solution: take steps to actively memorize them. You might follow the plot of a novel and recall the major events without a problem. But the names of certain characters might not stick in your mind so easily. The same with place names, numbers or dates. Use memory visualization techniques to solve this problem. Here's an example. In the short story "Salvador", author Lucius Shepard refers to a village in El Salvador called Tecolutla. That is not an easy-to-remember place name, at least not for me. When I first encountered the scene involving Tecolutla, I paused for a moment to consider the sound of the name. I quickly came up with "tea-coat-loot-lay". As I've learned from experience, that's plenty close enough for creating an effective memory hook. Next, I quickly converted that sound string to a unique, memorable image. In my mind, I see a soldier in a dark trench coat. A flood of iced tea is raining down on his coat as he bends over to lay some loot in the center of the village. That this image is strange and impossible is an advantage. That it is unusual is what makes it memorable. The mind remember the bizarre more easily than the ordinary. When I want to recall the name of that village, the mental image I formed from the sound of the name simply pops into my mind. It really does happen that way. I then quickly translate the picture (tea-coat-loot-lay) back to the actual name of that town. It's that easy and fast. There are other memory techniques you can use while reading. For instance, the Link method can be used to memorize the string of events in a plot line. The Phonetic Number method (a.k.a. Major system) can be used to memorize strings of numbers, including dates. And the Peg method can be used to remember ordered lists of any kind. If you have a study partner, consider reciting the factual information out loud. Research indicates selective verbal recitation (out loud, to yourself) can improve your memory of the material by 25% or more. Memory is boosted even further if you read it out loud to another person. Stopping to memorize facts as you read might seem counterproductive if you're hoping to increase your average reading speed. However, forgetting what you've already read and having to go back and re-read it lowers your average reading speed a lot more. You'll save lots of time by memorizing as you go. If you have poor reading skills, you'll naturally have a slower average reading speed than someone with better skills. A broad vocabulary, in particular, can increase your average reading speed significantly. That's because you don't stumble over unknown words as often. If English is your second language, or if you're aware that your vocabulary is not as broad as it should be, invest time in learning new words. Nothing slows down a reader like not knowing the meaning of a word in the text. They either need to stop and look the word up in the dictionary, or skip it and fail to grasp the full meaning of the passage. Whenever you encounter a new word during reading, take a moment to find the meaning in a dictionary. Keep a running list of the new words you learn and their definitions, and review the list periodically. Your vocabulary will grow, and your reading speed will increase! 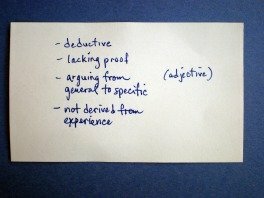 Index cards also work very well for this (see images above and below). 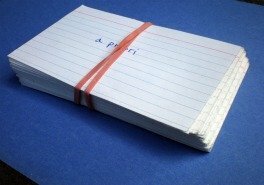 I prefer to use index cards rather than a list to keep track of new words I learn. It doesn't take much time at all to flip through a stack of cards and test your recall of the definitions. Speed reading is a skill that gives better results the more diligently you practice it. 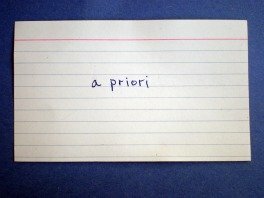 The same is true of memory techniques, and of looking up new words whenever you encounter them. Use the three tips above every time you read, whether an essay, a newspaper or journal article, a book, or anything else. Practice, practice, practice! Combine the speed reading pacer technique and memory techniques as you read. Grow your vocabulary. Master these tips, and your average reading speed will increase. You'll read more in less time, and you'll remember the information better in the process.